We started 2017 off by catching up with our friends at The Brew Enthusiast, and spent some time discussing/enjoying 'Burg beer and looking ahead to what's brewing in the new year. Cliffs Notes: seasonal cans, bottle releases, more barrel-aging/fermenting, new small batch beers, and all the cheers you can handle! Full article available at The Brew Enthusiast! One of the biggest draws to me for opening a brewery was doing so with one of my best friends. Who doesn't like the idea of working together with someone you know you get along with, and someone who shares similar ideals to you on Day 1 in the workplace? And that dream is about to become a reality as we get ready to open The Virginia Beer Company in Williamsburg, VA in Spring 2016! For Chris, Jonathan, and I it has been a long, amazing, arduous, and fulfilling journey to build this brewery and finally, in 2016, begin brewing! For Chris and I in particular, the conversation to open a brewery started as far back as 2007 and really ramped up in 2010, before Chris & Erin quit their jobs in 2012 to move back to Williamsburg. As you can see from the very first press we ever received about The Virginia Beer Co. in this 2013 article from The Flat Hat, it took us a bit longer than expected to get up and brewing. Not for lack of planning and trying (we tell ourselves), but sometimes that's the way opening a new business goes. Preparedness and dedication will eventually win the day, and we've had a number of amazing experiences since returning to Williamsburg (I following suit full time in 2014). One of the things that kept us going was our fondness for the Greater Williamsburg area. A big reason for returning to Williamsburg to open a business was because it's where our story as partners began. While we looked at many different areas up & down the East Coast that could have been interesting places to open a brewery, at the end of the day we knew we were coming together over our love of beer in the state where we met, and doing so in the place that brought us together just made sense. It didn't hurt that Chris's wife, Erin, was also a William & Mary alum. Or that Chris and I volunteered for a board for the College and co-chaired our respective 5-year reunion gifts, both bringing us back to campus on a regular basis. Or that Chris's youngest brother, Will, was set to graduate from the same university in 2014. Whatever the reasons, we had a continued appreciatioin for our time at W&M, for the lessons learned while there, and for the personal connections we had maintained since graduating. One thing was for certain: when the time came to start our adventure in 2012, we had no doubt that Williamsburg was the place to do so. It was the home to a community that had already given much to us and our friends and our families. We were already giving back to the college community part-time, so why not make it a full time endeavour and give back to the Greater Williamsburg area community on a full time basis? The passion to create something that could foster community engagement and be philanthropy focused was there and we simply needed the place and the mechanism to bring it all together. It has taken us longer than we thought. It's been more expensive and more frustrating than ever imagined. But recently, Chris and I were afforded opportunities to reflect on our stories. Chris was even asked by his high school alma mater (Westminster School), a high school that his wife and all of his brothers also attended, to reflect way back about what then and what now tied together to push him down an entrepreneurial path. I recently had the opportunity to reflect on my relationship with my collegiate alma mater, an alma mater shared with Chris and his wife and Chris's youngest brother, about where my experiences have led me. All of this reflection reminded us about the authenticity of our place and plan, and why we've continued to forge down the road of uncertainty to open a brand new brewery amid a booming brewing landscape. Long story short: here, in Williamsburg, it's personal. It's why we're here. It's why we're still here. And it's why we love being here! So what's in a story? Well, to us, just about everything. And we hope that you'll agree when you have the chance to sample The Virginia Beer Co.'s rotation of beers at 401 Second Street this spring! As we've previously discussed, the road to finding the right design to compliment an idea for a new business is a long and colorful one. And this finale to our adventures in (company) branding is no different, so we hope you'll bear with us for one more chapter... As entrepreneurs, Chris and I had spent years cultivating the notion to open a business in the beer industry. From there, we narrowed our focus to a brewery and taproom instead of a brewpub. We decided on a name, and then set our sites (pun intended) on Williamsburg, VA, home of the alma mater to me, Chris, and his wife, Erin. As our aspirations began to fill out a business plan, we had already gone through a number of iterations of what styles of logos we liked and how we wanted to represent our own brand in the form of words and images. From local help as far back as 2012 to professional support both near and far in 2013 & 2014, we had continued to refine our brand along the way. As 2014 came to a close, we had accomplished much while we worked towards opening The Virginia Beer Company. We finally signed a lease for our building at 401 Second Street; we ordered equipment from DME; and we added a new full time member to our team when our brewmaster joined us. Surging into 2015, the conversation about how to establish and grow our new brand continued. We had new input from a new member of our team who had experience working in the craft brewing industry. We continued to take stock of all of the brewery openings going on around us. And we further discussed how best to utilize a name like The Virginia Beer Company. A lengthy discussion about how to apply our brand to individual beers had also ensued during this time. Names? Images? Colors? So many aspects to consider to make a beer attractive not just in taste but in appearance and story as well. We conferred and decided that a bold primary image would allow us to focus on changing the color scheme of each of our flagship beers while keeping the overall logo the same image and format, thereby reinforcing brand recognition as we expand to new markets and add cans and bottles to shelves. But what would that logo be? Would any of our previous iterations resonate with our future audiences? Outside of our home market, what if new consumers were not familiar with our William & Mary background? What story did we want our logo to tell on taps, bottles, and cans? The three of us agreed that it was important to call on our roots with our logo, but realized that doing so in a broad manner was important since our name encompasses an entire Commonwealth. Though it's important to create a draw in our local market, our business goal is to expand the footprint of The Virginia Beer Co. to other markets within the state, and eventually to surrounding states and well beyond. How to accomplish both while staying true to our origins? As we considered these topics and made crucial decisions about how we wanted to begin and grow our business, we were approached by an artist named Matt Leech. Matt is a Virginia based graphic designer who has done some previous work in the VA beer scene. When Matt got in touch he posed many of the questions about branding that we were already asking ourselves. And in addition he made a few recommendations that coincided with the business plan we were formulating not in 2012, 2013, or even 2014, but the one we were working on in 2015. Matt encouraged us to think simple when it came to our primary logo. After all, this image is going to be used everywhere: "Stickers, glassware, tap-handles, wax seal stamps, at the bottom of posters for events that you sponsor, the list goes on and on." Matt reinforced the idea of simplifying our image so that wherever and whoever it is, people immediately know what to expect from our brewery. Working to open The Virginia Beer Co. for so long, and being William & Mary alums at that, the image of the Crim Dell Bridge really appealed to me and Chris. It's interesting, it's local, and it's got a wonderfully unique construct. Something of note that Matt asked us to consider about our branding was to think about any image in a 1-inch square and answer the question, "Is it easily recognizable?" We all agreed that we will have plenty of opportunities to showcase more complex and symbolic imagery, but that there are many instances where that level of detail simply can't or won't be translated due to space, size, or physical display constraints. Citing many of these concepts, we changed our primary focus to the Deadrise shape, bordering variations of the logo as far back as 2013. We all concurred that this is a powerful, unique shape that can easily be explained to anyone anywhere in the state and out. It's not local, but it's also not a well-known fact that it's the state boat of Virginia, so there's a great story behind the shape - one that really enticed us and that we believe can help to explain our story as The Virginia Beer Company. In terms of palette, we originally chose the shade of red we did because it is the actual color of the Crim Dell Bridge. It is also similar to the colors in the Williamsburg Color Collection from Benjamin Moore, a local shout out. We still liked the colors in that collection; they are more earthy and muted. Taking our shared feedback to heart, Matt worked in early 2015 to help us visualize a set of logos that we feel embody the vision for The Virginia Beer Company that Jonathan, Chris, and I had all come to share. In addition to retaining many of our color schemes from previous iterations, we were thrilled that the inspiration for the type in the logo is the shape of the Crim Dell Bridge; the base of the word "Virginia" arcs over a flat top line of the word "Beer." We still love that bridge and believe there is a place for it in our logos, and in our location. As we continue to make plans for our taproom and beer garden, it's certain the Crim Dell will be prominently featured on site at 401! We also took to the tweak of the font to something that looked vintage. While we haven't been open for a long time, we have been working to build the next great brewery for a long time. While we couldn't express that in our established date, we felt we could express it in the style and boldness of our font. And we felt that the vintage look of the "shield logo" was a fitting homage to the history of our building! Specifically increasing the size and placement of the key points of the logo helped us to express the core of what we're all about: Virginia Beer! The other aspect of our brand we had been toying with was a slogan. We love the idea behind "Old Town. New Beer." but felt it was a concept that could be centered around our taproom experience. While we have plans to eventually expand throughout Virginia and farther, we also want people to be excited about what's going on in our taproom. The VBC taproom will be an experience in its own right, especially with Jonathan churning out experimental series on our 5 BBL pilot system! And this slogan seems like a perfect way to express that we are going to constantly have new beer in our taproom, located in one of the most historically old towns in America. It acknowledges the history-heavy identity of Virginia while having a forward-facing, modern mentality...exactly how we'd like to create the experience for visitors at 401! For a global rallying cry, we considered: "For The Common Wealth!" When we asked Matt to incorporate this into some of our secondary logos, he did so after we all agreed to one update of the phrasing to: "For Our Common Wealth!" By changing "The" to "Our", we feel we're involving everyone in our cheer. After all, we are all coming together in the celebration of wonderful, Virginia beer. We knew it was important to pay homage to the State (or Commonwealth, as it were) of Virginia, especially with such an all-encompassing brewery name. And we knew we wanted to bring everyone together around what we expect to be a wonderful product in an already amazing industry. So this cheer fit the message we want to send with our beer, but we then realized that it may strike too close to another brewery, Commonwealth Brewing Company, which had recently opened in Virginia Beach. Back to the drawing board! We look forward to us all raising a glass of Burg Beer together at 401 for our common wealth! As we did when we settled on the name of the brewery, we decided to bring our theme back to its roots: for us, it's all about people & place, beers & cheers. The Virginia Beer Company is meant to be a celebration of all the great people and all the great beers coming out of this great Commonwealth, and the business is meant to be a force for good in the Williamsburg community. To simplify these mantras, simply: "Cheers from Williamsburg, Virginia!" 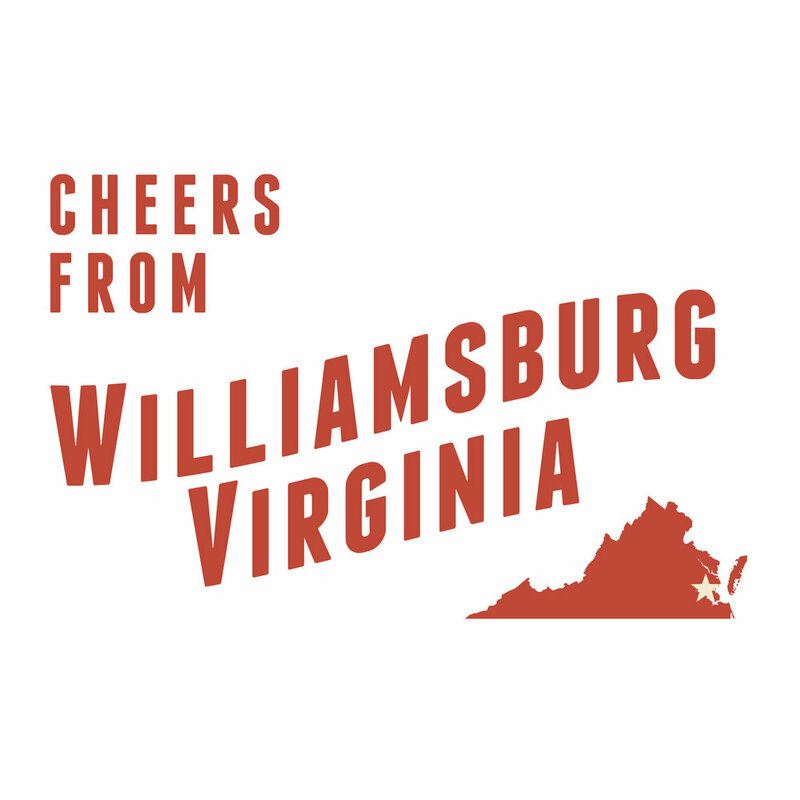 The end result is a logo featuring state, local, and place imagery, with a focus on the core passion we have for the Williamsburg community and the business of beer. We continue to think critically about how important our current location, our backgrounds at William & Mary, and our coming years of expansion as a business are when it comes to what we plan to showcase in our logo. Craft beer is already a very stylish industry! Beer is inherently artistic from the amazing colors that various styles of beer promote to the many types of serving vessels into which these beers are poured. Packaging, tap handles, and merchandise combine forces to turn each brewery into a thriving, organic, beverage palette; and when done right, a brewery's brand can entice not just the taste buds, but many of the other senses as well. We can't express our thanks enough to all those who have had a hand in helping us visualize our brand. From the volunteers to the professionals to the many who have offered feedback and asked questions, each of you has had a hand in developing who we are as a brand and what we plan to offer as a brewery. We wouldn't be where we are today without everyone's involvement along the way. And we look forward to moving forward with our brand, both in the beers we brew, and the experience we offer in our taproom and beyond. It's going to be a lot fun! We're stoked to have all of you along for the ride with us; and we look forward to raising a glass (or three) together For Our Common Wealth! In other words, CHEERS FROM WILLIAMSBURG, VIRGINIA! When we last left off, The Virginia Beer Company had taken a break from developing our logo as we turned our attention to other pressing aspects of starting this business: finding a location, raising capital, hiring a brewmaster, recipe development, etc. We received some amazing design concepts in 2013 from a graphic artist at Sarah Peng Design, but realized that as we focused our energy on developing a brand, we still didn't know exactly what that brand was supposed to represent. We knew we were opening a brewery with a taproom and beer garden in Williamsburg, VA. We knew we would be called The Virginia Beer Company. And we knew we wanted to brew a lot of beers - to specialize in variety, as it were! But recipe development was still an ongoing (and awesome) endeavour. Our site search was in Round 2 of what would eventually be a three round bout. And our future brewmaster was still in Atlanta, making it difficult to define a brand without a core component of that brand available to participate in the discussions. Essentially we had gotten ahead of ourselves on the artistic side, and so turned our attentions in early 2014 to establishing our business in Williamsburg before committing to defining and expanding the brand any further. As it would turn out, the focus on Williamsburg was exactly what was needed to refine our brand in the early stages of '14. The original concept for our logo was developed by a William & Mary student with a talent for visual design, and that initial scope was focused on our W&M roots. We then turned to a more seasoned artist for new variations in 2013, and as luck would have it we would next turn to a seasoned artist who also happened to be a Williamsburg resident for 2014's branding direction. We had the fortune of being introduced to Abigail Darrin, who had already done concept work for Williamsburg restaurants such as DoG Street Pub and Blue Talon Bistro (visit Abigail's website to check out her awesome portfolio!). As we continued to spend time in Williamsburg, promoting our ideas and meeting others in the food and beverage industry, we were introduced to Abigail, who was not a W&M alum. This afforded her the ability to consider imagery and styles that were relevant to Williamsburg but not specifically centric to campus life. Since Chris and I met at W&M and had spent much time volunteering for the College after graduation, we admitted that our ideas for building a brand often times had blinders focused on pride for the Tribe. In our eyes this wasn't necessarily a bad thing, but with a surprising number of W&M alums already working in the Virginia brewing industry, and green & gold logos at the time already promoted at Center of the Universe Brewing Co., we determined that at least to an extent: we needed a push past the Wren. Our new artist had experience working in the food and beverage industry, and as a Williamsburg resident was familiar with the surrounding area. We had a number of meetings to discuss our wants - what we saw as powerful tools for building a brewery brand - and to discuss where we were struggling to come up with a unique spin on a straight forward name like The Virginia Beer Company. The first area where we changed focus was no longer using the outline of Virginia for our primary imagery. The recommendation was made that the Commonwealth of Virginia was already referenced in our name, so we didn't necessarily need to promote it again within all of our logos. Second, since we were dead set (pun intended) on using the outline of the Chesapeake Bay Deadrise in some form as our logo's outline, it was suggested that we may want something symmetrical within those confines to easily adjust to the sizing differences of tap handles, glassware, and merchandise. A symmetrical image would look the same from all angles. If that image was also simple and sharp it would leave a lot of room inside the outline for future additions (e.g., if we wanted to add auxiliary images for seasonal beers). Taking into consideration all of these insights, we provided our artist with a number of images that we thought would appeal to a local audience, but also translate well as we expanded both far and wide (and with sights set on obtaining a 10,000+ sq. ft. facility, expansion is in the plans). We suggested colors we felt matched the energy of the brewery and that would be unique in a growing field of peers within the craft industry. What we received really impressed us, both as the loyal William & Mary alums and the well-traveled craft enthusiasts we had become since passing beyond the brick walls of the College's campus. The first thing that jumped out about this new variation was that it combined the proposed focal image of the logo, the Crim Dell Bridge, with the name and location of the brewery. In prior iterations we had focused on having the name within the Deadrise outline and placing the supporting logo imagery elsewhere. This combination, with a sharper, slimmer font and a primary image not as large as Virginia's silhouette, allowed for both to be combined into one space. Plus the iconography of the Crim Dell resonated with us! It was a reference to a landmark on William & Mary's campus, tucked away with it's own set of local folklore to play off of if we so chose. We liked the idea of this image symbolizing our own W&M trappings but also "bridging the gap" between beer drinkers from all over. Williamsburg has roots in big beer and small, and it is our goal to bring those roots together under one appreciation for great beer! We also enjoyed the openness of the design; this would allow us to add secondary images as needed, such as wreaths for a December Wassail or the Richmond skyline for our eventual releases in RVA. Adding the location of the brewery was a nice promotion of our college town establishment and good advertising for new markets we would venture into. Of course, the adventure of opening a new business (brewery or otherwise) tends to be a long one with more than a few forks in the road. Our expectation was that we would be open in 2014, and in a location that turned out not to be our final landing spot. As our brewmaster made the move to Williamsburg and as we finally closed on a space in late 2014 (401! ), our discussions about brand development continued to mature and refine themselves. As we finally began to formalize permanent, critical details about the future of our business - an address, recipes, equipment sizing, opening timeline, distribution plans - we also formalized critical details about what the themes of the brewery would be when The Virginia Beer Co. finally opens in Fall 2015. A new year and firmer direction brought with it some new motifs and one final iteration of our brand development. We are incredibly grateful to everyone who has been involved in the maturation of our brand imagery, a process (like every aspect of opening The Virginia Beer Company!) that has spanned more than three full years. And we in turn look forward to unveiling our final branding very soon. Tune in for the next chapter of our pre-opening adventures in art (and stay tuned for more in our ongoing adventures in beer)! I wanted to title this post "Back to the Brewture" but felt that was just trying too hard. With the recent celebration of Groundhog Day and Mr. Punxsutawney Phil (or Chesapeake Chuck, as it were) having declared six more weeks of winter, this felt like an appropriate time to look back on how far The Virginia Beer Company has come over the last 13 months. Originally this was meant to be a 2014 retrospective, but things have continued to roll right along in the wee hours of 2015, so here's a look back on all that occurred for Team VBC in 2014 and some spare change in the new year! Click below to take a trip back in time with The Virginia Beer Co.! From the early stages of our saga to find a visual brand identity, we now to flash forward to the year 2013. After receiving our very first submission for a Virginia Beer Co. logo, Chris and I took some time to come up with our ongoing action plan for brand development. We decided one of our next steps was to first focus on the border of the logo – we wanted to come up with a primary shape and outline that was not only unique, but that incorporated something unique about Virginia into the overall profile of the logo. We also agreed that while we loved incorporating William & Mary themed imagery, we were not sure that we wanted to use the College’s colors of green and gold as our own primary colors. Another fairly new brewery in Virginia, Center of the Universe Brewing Co., was already using green and gold as a primary color scheme at this time, plus one of their founders was also a W&M alum. Despite our overflowing Tribe Pride, we decided to see what other color combinations attracted the eye and would speak to us as purveyors of The Virginia Beer Company. As luck would have it we would end up liaising with another student for this round of creative brainstorming. This time through a personal contact, we were put in touch with an aspiring graphic artist, Sarah Peng, who was enrolled in an art program at Syracuse University and who had her own blossoming graphic design business, Sarah Peng Design (check out Sarah's other work - good stuff!). Chris and I took the time to organize our ideas on how to develop a logo for our company. We wrote up a new three page document full of content about other designs and brands we enjoyed, with details about what particular details really appealed to us. Colors, Images, Borders, Imagery, Density, Symmetry, Shading, Complexity, Size, Font – these were all categories on which we drafted our thoughts. We included links to images and companies that had at least one aspect of these selections that to us, seemed to pop. Working with our first professional designer, we really tried to come over the top with as many concepts as we could muster together in order to paint a picture of how many beer brands there were in the world, and how we wanted to create our own brand within this growing market. Add to this burgeoning list of wants that we also wanted to develop a logo that would help tell our story, and we were really asking a lot for one simple rendering! This brand needed to express why we were calling our brewery The Virginia Beer Company (at this point we still weren’t sure if we’d be going by The Virginia Beer Company vs. Virginia Beer Company vs. Virginia Beer Co.!). Our logo needed to express that we had met at the College of William & Mary in Williamsburg. And it needed to express that we would be brewing and selling great craft beer! We met with our artist to discuss the design process and then submitted our updated concept ideas, along with the already drafted pages upon pages upon pages of other logos and Virginia based concepts we’d pooled together. Then we awaited our next look at the maturing Virginia Beer Co. brand identity (see below). The first distinct change made in this iteration was the new outline of the logo. We had keyed into this elongated pentagon shape, which in actuality is the outline of the state boat of Virginia, the Chesapeake Bay Deadrise. We found this to be a creative way to incorporate some Virginia symbolism into our brand, especially with a future brewery location not terribly far from the shores of the Chesapeake. The next change was the incorporation of the outline of Virginia itself as a primary image within the logo. We really wanted to impart our name into our brand image and this was our first attempt at doing so. And we wanted to highlight where we were brewing...and that we would brewing! One of the benefits of working with a professional artist was the full spectrum of color combinations we received in her submissions to us. This was the first time anyone had taken a logo idea and offered suggestions for other facets of the brewery operation, such as neck labels and bottle caps and website usage. Our work during this time period really helped us to somehow both narrow and expand our vision for Virginia Beer Co. branding all at once. We were so enamored by the images and color combinations that were flowing our way in such professional presentations that our eyes became larger; we requested more variations, without settling on one as a starting point. Chris and I were still in the throes of so many other conceptual aspects of opening a business – raising capital, real estate searches, brewer interviews – that seeing something visual and palpable really made us excited. But that excitement was also our downfall. We had a difficult time settling on one scheme or style, and every time we would make progress narrowing down the field we would get distracted by other facets of the startup. Our meeting schedule was chaotic, our focus was everywhere, and our artist was in a different city so we couldn’t always predict when we would be available to discuss our ideas when they were fresh. We were forced, due to the pressures of focusing our attention on more pressing concerns like money and land, to postpone our logo work. Entrepreneurial fate ferried us to other adventures, and our desire to craft a lasting brand image for our fledgling business would have to wait until 2014 to finally evolve into its next form. Join us soon for Part 3, the next installment of this gripping graphic imagery series (major motion picture release date pending)! We’ve already written about how important it is to find the right brand image for your brewery and your beers. This is true of almost any consumer product, be it beer, food, lawn gnomes, or anything in between. Some may argue that the quality of a product will speak for itself, but others will note that if the buyer isn't attracted to the item to begin with then they may never discover that product's quality. Here at Virginia Beer Co. we believe it’s a little bit of Column A and a little bit of Column B. Especially in today’s ever-growing craft beer market, it’s important to have a logo that’s unique. And one that pops (that’s pops, not hops)! One of my favorite games when I’m at a bar is to scan the various tap handles lining the draft options. Even before I look at the beer menu, I like to see what handles jump out among the field. The same can be (and will be) done any time I wander into a bottle shop or grocery store. The shelves are lined with six packs and bombers from all over not only the States but the World. Sometimes I may go in with a specific shopping purpose, and sometimes I let my wandering eyes dictate the purchase. That’s not to say that branding and logos need to be neon in color or gigantic in size to attract (there’s a difference between attraction and distraction), but it is important to stand out; to create your own landscape; and in words and images, to reflect your brewery and your beers. No easy task, especially when you’re starting from scratch! When Chris and I embarked on our plan to open a new brewery, we considered a number of names for the venture. Once we decided upon The Virginia Beer Company and agreed that we would be opening said VBC in Williamsburg, next came a lengthy period of indagation to develop a brand identity. Outside of the facts that we had decided on a name and a location, it was going to be some time until we had any beer for public consumption...so we really needed that company crest to speak volumes for us until the building was in place and the pilot batches were fermenting. This was Summer 2012, and it would take us almost two years to come up with our final logo. We are a start-up company. Not everyone can be as fortunate as the Brooklyn Brewery to have a designer like Milton Glaser take a chance on you. So like any good entrepreneurs, we turned to friends to draft a few ideas on our behalf. We came up with a laundry list of logos and brands within the craft beer world that we really liked for numerous reasons (as noted in our earlier post about branding). So we handed out those pages upon pages upon pages of notes and beer “likes” to our friends who happened to have artistic talents. In addition, we spent a lot of time considering the Commonwealth of Virginia. 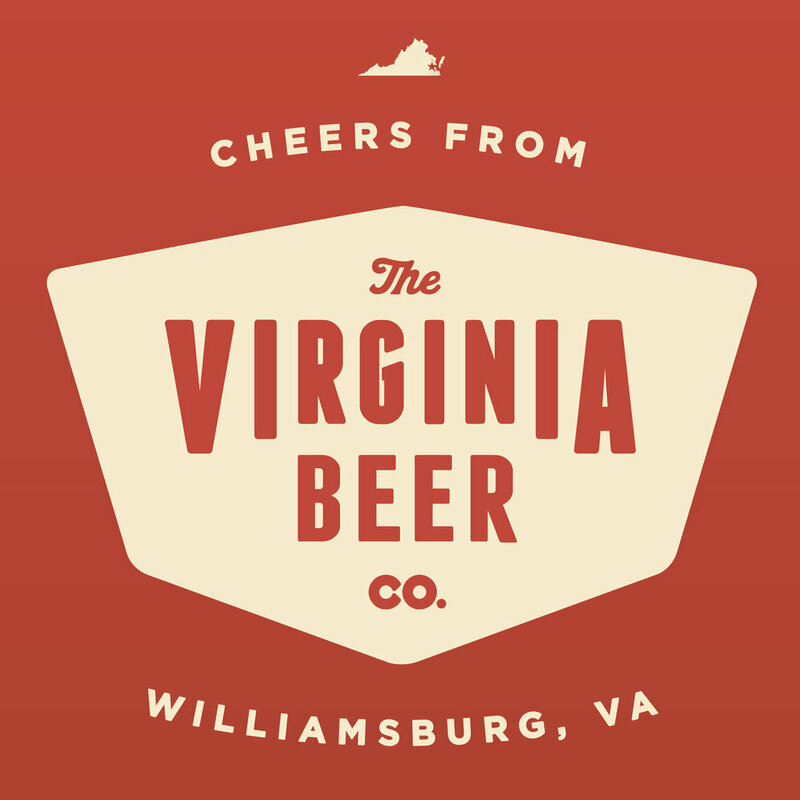 If you take on a name like The Virginia Beer Company, you want to reflect some semblance of your namesake in your logo. We considered a lot of aspects of our new home state and put those to paper. And handed those pages to our artistic friends, in addition to the pages upon pages (upon pages) that we had already turned over. Low and behold: we actually had one friend left who agreed to take us up on the challenge. One of the many great aspects of coming back to Williamsburg to start this business was reconnecting with The College of William & Mary, the alma mater of both me and Chris. In late 2012 we connected with a friend and current (at that time) W&M student who had both great interest and talent in graphic design. Below you can see our very first, third-party envisioned logo. The benefit of having a student connection through the school was the free labor. The downside of the student connection was that, inevitably, they have classes to attend. Our young artist needed to focus his time on more important tasks, which we begrudgingly agreed was the right thing for him to do. But we had our first proposal and it gave us a lot of momentum to feed on as we continued working towards our company’s future visage. We had a heckuva starting point, and now we needed to find a professional artist who could dedicate more time to tweaking our next ideas into our perfect vision for Virginia Beer Co.
Stay tuned for Part 2, where we’ll discuss how we (unintentionally) dramatically increased the scope of our vision before we were able to finally narrow it down into what would become our primary logo. Same blog-time! Same blog-channel! We are thrilled to formally announce the first addition to the VBC team (and it's a BIG one!) - three cheers for our Brewmaster, Jonathan Newman! Jonathan is a graduate of the American Brewers Guild. He has previously brewed at Jackalope Brewing Company in Nashville, TN and most recently at SweetWater Brewing Company in Atlanta, GA.
Now that Jonathan is in Williamsburg on a full time basis, we couldn't be more enthusiastic about the future of #BurgBeer (because this means A LOT more test batches)! Follow Jonathan on Twitter at @JNewmanBrews, and keep up with VBC on Facebook and Twitter & Instagram at @VirginiaBeerCo for more news. And check back in to VB(log)C soon for Jonathan's full bio and updates on our recipe development. Welcome to the team, Jonathan! Jonathan, left, pictured here with co-founders Chris Smith & Robby Willey, at the 2014 New Town Summer Fest in Williamsburg, VA. Respect the beer. And the beard.